Christmas jumpers, step aside, tt’s Halloween’s time to shine. One of the best things about the Christmas season is the excuse to wear big, comfy jumpers with ridiculous patterns. Sometimes there are lights, sometimes there are bells, and sometimes there’s music, all coming together to create a delightful clash of festive ugliness. It’s a compilation of things that from January to November would probably be considered weird to wear, but come December they’re welcomed with open arms. After years of limiting the creative jumpers to Christmas, the comfy garments have now been given another outlet. Ugly Halloween sweaters are finally a thing. HalloweenCostumes.com have brought out a whole range of the jumpers, with garish designs intentionally created to be considered ugly. The site offers both adult and child unisex sizes, so parents and kids can team up in matching ‘costumes’ to go trick or treating, while simultaneously keeping warm and cosy. 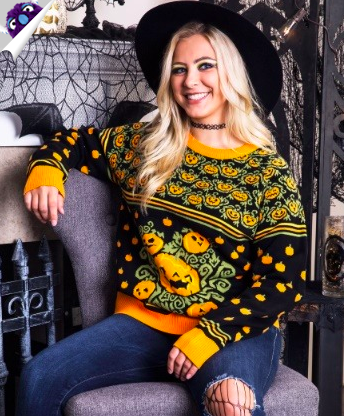 The jumpers feature designs of pumpkins, Dracula, dancing skeletons and cauldrons, and start at $39.99 (around £30) for the adult sizes and $29.99 (£23) for kids. As well as being comfy and season-appropriate, the creation of the jumpers has the added bonus of giving you an easy way out of thinking of a Halloween costume. As long as your jumper has some skulls or a pumpkin on it, you can officially be classed as getting involved and making an effort. If you’re really a fan of all things gothic, you could probably get away with wearing the jumper all year round. Your friends will just have to accept that it will be a permanent part of you for the foreseeable future. Tipsy Elves have their own collection of the heavily patterned clothes, but they’re obviously in high demand, because the website are running low on their skeleton-adorned sweaters. Feeling spooky? These ugly Halloween sweaters won’t exactly make people break out in a cold sweat, but they sure do make us laugh. In fact, we’ve got a whole skeleton full of funny bones at our disposal. And we’re putting them all to work designing fun and horrifyingly tacky Halloween apparel for our Tipsy Elves customers. While others may dress up as movie characters, superheroes, or random household objects, you don’t have to worry about putting together a costume this October. You get a pass when you are sporting a great horror holiday-themed top like these. Some Halloween-slash-comfy jumper enthusiasts are keen for the jumpers to take off, sharing their need for the clothes on social media. Ugly Halloween sweaters is a thing I didn’t know I wanted till now. 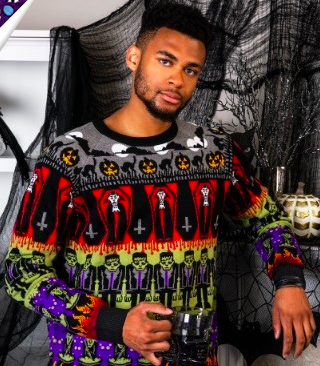 Ugly Halloween sweaters is a thing I didn't know I wanted till now. Bring on the haunting season.